T helper cells (TH cells) play a pivotal role in adaptive immunity. Following antigen recognition, naive TH cells are activated, undergo further differentiation, and secrete cytokines to promote ('help') and steer the immune response. All TH cells are positive for CD4, a coreceptor that complements the T cell receptor (TCR) to communicate with an antigen-presenting cell (APC). In human peripheral blood, 15–30% of all CD45+ leukocytes are T cells, with CD4+ T cells accounting for approximately two thirds of the total T cell population, and CD8+ T cells making up the remaining one third. In isolated PBMCs, T cells are with 45–70% of total cells by far the most abundant cell type. Up to 60% of total PBMCs are CD4+ T cells and up to 30% are CD8+ T cells. Depending on the cytokine environment, naive CD4+ TH cells might differentiate into several subsets, including TH1, TH2, TH17, TH9, TH22 cells, and T follicular helper cells (Tfh). Naive CD4+ T cells can furthermore differentiate into induced regulatory T cells (iTreg; PMID: 26688349). See chapter Regulatory T cells. Most T cell subtypes can undergo memory differentiation steps after activation by their respective antigen. Apart from differentiating into effector T cells, some naïve T cells (TNAIVE) may differentiate into various memory T cells subsets, such as stem cell-like memory T cells (TSCM), central memory T cells (TCM), effector memory T cells (TEM) and effector memory RA+ T cells (TEMRA). Each differentiated subset is defined by distinct surface markers. Antigen-inexperienced T cells express naïve marker CD45RA, as well as homing receptors CD62L and CCR7, but lack CD45RO and CD95 expression. With ongoing differentiation towards memory phenotypes, CD45RA, CD62L, and CCR7 are downregulated, while memory marker CD45RO and activation marker CD95 are gradually upregulated. With progressive differentiation towards the memory phenotype, antigen-dependency, tissue tropism, effector function, and senescence increase (PMID: 24258910, 26999211). Overview of human T cell differentiation from naïve to memory T cells (PMID: 24258910, 26999211). Miltenyi Biotec has created dedicated application protocols for the isolation of different CD4+ T cell subsets. Miltenyi Biotec offers various kits for the direct isolation of CD4+ T cells from peripheral blood and blood products. No specific sample preparation is needed when using those kits. CD4+ T cells can also be isolated from peripheral blood mononuclear cells PBMCs, which can be generated either by density gradient centrifugation or using the MACSprep™ PBMC Isolation Kit, human. For details, see the MACS handbook chapter human blood. Miltenyi Biotec has developed numerous products for the straightforward magnetic separation of CD4+ T cells and corresponding subsets. T cells can be isolated either straight from whole blood, buffy coat, leukoreduction system chambers (LRSC), or Leukopak® without density gradient centrifugation and erythrocyte lysis, or from PBMCs. The StraightFrom® MicroBead Kits were developed for the rapid positive selection of target cells directly from whole blood, buffy coat, LRSC, or Leukopak®. None of the kits require any sample preparation, like density centrifugation, erythrocyte lysis, or cell count. The appropriate kit is chosen based on the starting material. With the StraightFrom Buffy Coat CD4 MicroBead Kit, human, CD4+ cells are separated from an entire buffy coat in less than 30 minutes. The kit can be used in combination with a QuadroMACS Separator for manual separation, but is best combined with the MultiMACS™ Cell24 Separator Plus . Isolation of CD4+ T cells directly from buffy coat. Separation of a buffy coat sample using the StraightFrom Buffy Coat CD4 MicroBead Kit and the MultiMACS™ Cell24 Separator Plus with the Single-Column Adapter and Whole Blood Columns. Cells were fluorescently stained with CD4-PE, CD14-APC, as well as CD45-VioBlue® and analyzed by flow cytometry using the MACSQuant® Analyzer. Cells were triggered via CD45-VioBlue. Cell debris and dead cells were excluded from the analysis based on scatter signals and propidium iodide fluorescence. Alternatively, the MACSxpress® Cell Isolation Kits allow the column-free isolation of target cells from freshly drawn anticoagulated whole blood, buffy coat, or LRSC by depletion of non-target cells. MACSxpress Whole Blood Kits are ideal for the processing of larger sample volumes (total capacity 3x30 mL) and are available for the isolation of CD4+ cells and CD4+CD45RO+ memory T cells. Specialized MACSxpress Kits enable the isolation of CD4+ T cells from an entire buffy coat or LRSC. The MACSxpress Whole Blood CD4 T Cell Isolation Kit was developed for the fast and easy isolation of highly pure CD4+ T cells directly from whole blood. Non-target cells are removed by immunomagnetic depletion using MACSxpress Beads. Simultaneously, erythrocytes are sedimented, yielding target cells of high purity. Highly pure untouched CD4+ T cells. Untouched CD4+ T cells were isolated from 30 mL of human EDTA-anticoagulated whole blood using the MACSxpress Whole Blood CD4 T Cell Isolation Kit, a MACSmix™ Tube Rotator, and a MACSxpress Separator. The kit allows the isolation of label-free CD4+ cells, because the complete labeling complex can be released from the cell surface after separation. Instead of working directly with whole blood or blood products, samples can be processed over a density gradient centrifugation to pre-enrich peripheral blood mononuclear cells (PBMCs) as starting material for subsequent TH cell isolation. CD4 MicroBeads, human enable positive selection or depletion of CD4+ cells by direct magnetic labeling. The CD4+ T Cell Isolation Kit, human enables fast isolation of untouched CD8+ cytotoxic CD4+ T cells from PBMCs in only 18 minutes. This updated kit offers even better performance and a significantly shorter protocol, replacing its well-known predecessor. Isolation of untouched CD4+ T cells from PBMCs. Samples were processed using the CD4+ T Cell Isolation Kit, LS Column, and a MidiMACS™ Separator. Cells were labeled with CD4-PE and CD3-FITC and analyzed by flow cytometry using the MACSQuant Analyzer. The REAlease® CD4 MicroBead Kit, human offers a rapid solution for the positive selection of CD8+ CD4+ T cells from PBMCs with the option to fully remove the MicroBead and antibody labeling. Cells are thus completely label-free and ready for any downstream application, including a second round of magnetic labeling and separation for further subset isolation. Label-free, highly pure CD4+ T cells. (A) CD4+ T cells were isolated from human PBMCs using the REAlease CD4 MicroBead Kit, MS Columns, and a MiniMACS Separator. Cells were fluorescently stained with CD4-FITC and analyzed by flow cytometry using the MACSQuant Analyzer X. Cell debris and dead cells were excluded from the analysis based on scatter signals and propidium iodide fluorescence. (B) The efficient removal of all labels was shown by using Anti-Biotin-APC to analyze the cells by flow cytometry for the presence of REAlease Biotin Complex. Directly after isolation, the cells showed staining of biotin ("MicroBead-free CD4+ cells"), whereas the label-free CD4+ cells after the REAlease Biotin Complex release were negative for biotin similar to the non-labeled cells before separation. Release efficiency was higher than 99% for the REAlease Anti-Biotin MicroBeads (CD4). The Naive CD4+ T Cell Isolation Kit II, human was developed for the isolation of untouched naive CD4+ T cells from PBMCs. Memory CD4+ T cells and non-CD4+ T cells are labeled with a cocktail of biotinylated CD45RO, CD8, CD14, CD15, CD16, CD19, CD25, CD34, CD36, CD56, CD123, Anti-TCRγ/δ, Anti-HLA-DR, and CD235a (Glycophorin A) antibodies, and then magnetically labeled with Anti-Biotin MicroBeads for subsequent depletion. 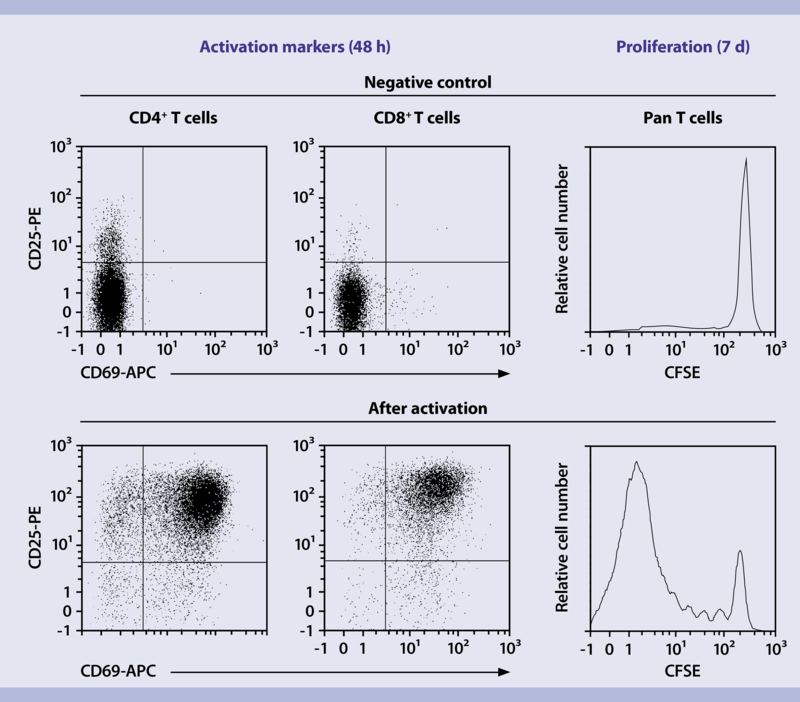 Isolation of untouched naive CD4+ T helper cells from PBMCs. Samples were processed using the Naive CD4+ T Cell Isolation Kit II, an LS Column, and a MidiMACS Separator. Cells were stained with CD4 and CD45RA antibodies. The Memory CD4+ T Cell Isolation Kit, human is used to isolate untouched memory T helper cells from PBMCs via depletion of naive T cells, CD8+ T cells, B cells, NK cells, γ/δ T cells, monocytes, DCs, granulocytes, platelets, and erythroid cells. PBMCs are incubated with a cocktail of biotinylated CD45RA, CD8, CD14, CD16, CD19, CD56, CD36, CD123, Anti-TCRγ/δ, and CD235a (Glycophorin A) antibodies. Non-target cells are then magnetically labeled with Anti-Biotin MicroBeads for subsequent depletion. Isolation of untouched memory CD4+ T helper cells from PBMCs. Samples were processed using the Memory CD4+ T Cell Isolation Kit, an LS Column, and a MidiMACS Separator. Cells were stained with CD4 and CD45RO antibodies. The CD62L MicroBeads, CD45RA MicroBeads or CD45RO MicroBeads are used to positively select the respective cells according to the given marker. Example separation with CD62L MicroBeads, human. CD62L+ cells were separated from PBMCs using CD62L MicroBeads. For positive selection, CD62L+ cells were isolated using an MS Column and a MiniMACS™ Separator. For depletion of CD62L+ cells, the sample was separated over an LD Column in a MidiMACS Separator. CD4+ T cell subsets and their differentiation status can be determined by flow cytometry based on the expression of cell surface markers, transcription factors and their secretion of cytokines. Miltenyi Biotec offers a vast portfolio of conventional and recombinant REAfinity™ Antibodies for comprehensive analysis. Human TH cell subsets and corresponding polarizing cytokines, surface markers, transcription factors, and secreted cytokines. The following antibody combinations for surface marker, and intracellular cytokine, and transcription factor staining can be used to identify CD4+ T cell subsets by flow cytometry. 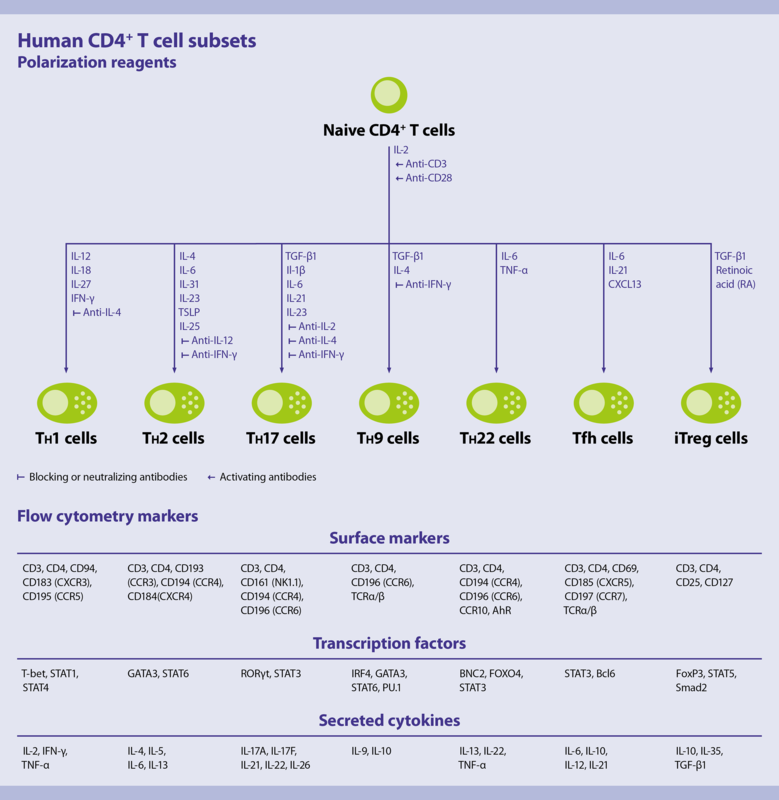 At a glance: Markers for the analysis of CD4+ TH cell subsets using MACS antibodies. 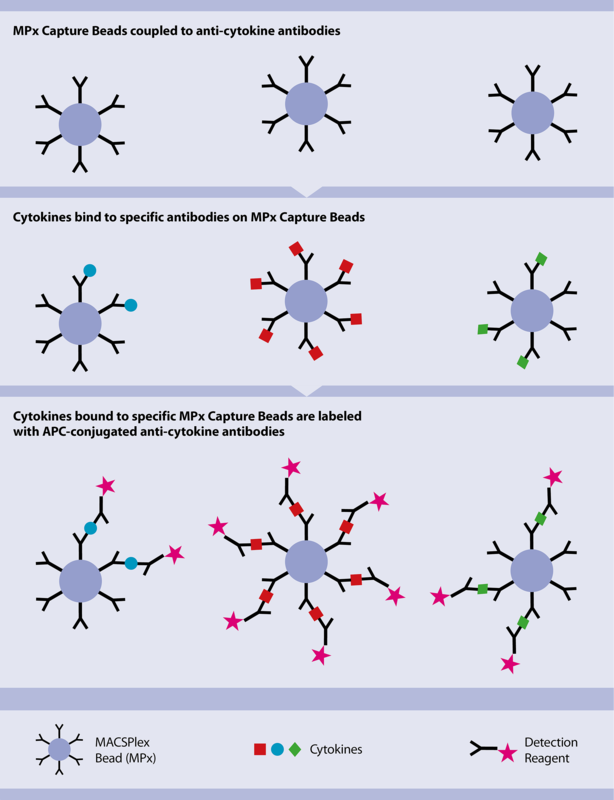 The Rapid Cytokine Inspectors allow for rapid analysis of activated T cells by combining surface marker analysis (e.g., CD4, CD8, CD154) with intracellular cytokine staining (e.g., IFN-γ, TNF-α, IL-2 and IL-17). TexMACS Medium, research grade is a serum-free cell culture medium developed specifically for T cells. It has been used in a variety of applications and, in combination with MACS Cytokines, is an ideal starting point for reliable cultivation conditions. The medium is also available in MACS GMP grade, and with or without phenol red. For detailed information about Miltenyi Biotec media optimized for T cells, see the chapter Cell culture media. Comparison of expansion rates of human T cells in different media. Cells were expanded in TexMACS Medium, a competitor product, and serum containing basal medium (RPMI + 10% FBS) using the T cell Activation/Expansion Kit, human. 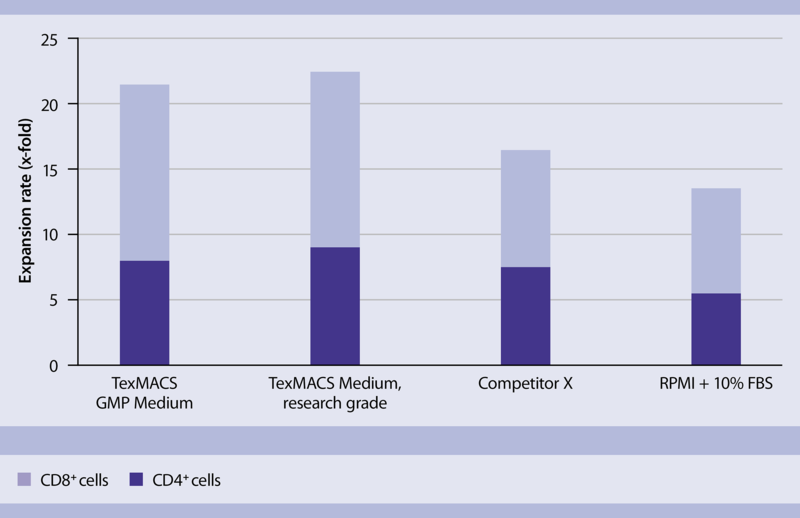 Comparison of T cell expansion rates with TexMACS Media and a competitor product. 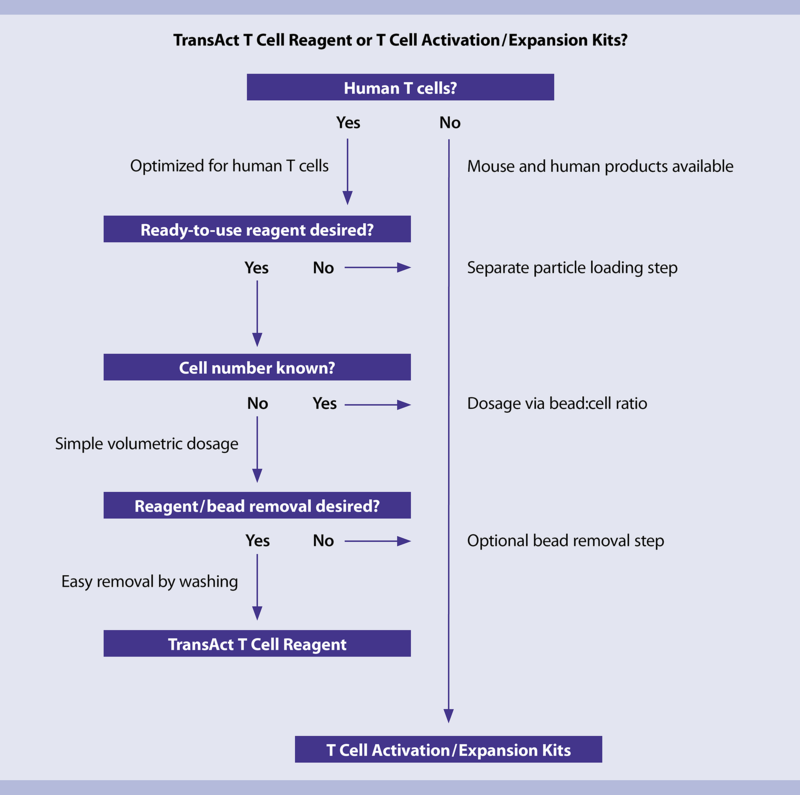 T Cell TransAct is a ready-to-use reagent that is applied volumetrically, eliminating the need for bead-to-cell ratio calculations. Excess reagent is simply removed via culture wash. T Cell TransAct is available in both research and GMP grades, for a seamless transfer of workflows into clinical settings. Activation of human purified T cells. T cells isolated using the Pan T Cell Isolation Kit were activated for 48 hours using T Cell TransAct™ in TexMACS Medium supplemented with Human IL-2. Cells were fluorescently stained and analyzed by flow cytometry using the MACSQuant Analyzer. T cells isolated using the Pan T Cell Isolation Kit were activated for 48 hours using the T Cell TransAct (titer 1:100) in TexMACS Medium supplemented with Human IL-2 (20 IU/mL). The negative control experiment was performed without adding the T Cell TransAct. Cells were fluorescently stained using CD25-PE and CD69-APC and analyzed by flow cytometry using the MACSQuant Analyzer. CD4-VioBlue was used for selection of T helper cells and CD8-VioGreen was used for selection of cytotoxic T cells. Dead cells and debris were excluded from the analysis based on scatter signals and propidium iodide fluorescence. The T Cell Activation/Expansion Kit, human employs large cell-sized particles loaded with biotinylated antibodies of choice to activate and expand primary cells. The large cell-sized particles mimic antigen-presenting cells and, when loaded with CD2, CD3 and CD28 and applied in a specific bead-to-cell ratio, lead to efficient T cell activation. Use the decision tree to determine the right T cell activation product for your project. CytoStim™ is an antibody-based reagent that rapidly stimulates T cells. It can be used as a non-toxic alternative to SEB, e.g. for the positive control of antigen-specific T cell stimulation assays or intracellular cytokine staining experiments to detect cytokine or activation marker expression. PepTivator® Peptide Pools enable the antigen-specific stimulation of both CD4+ and CD8+ T cells with an extensive panel of tumor-, virus-, fungi- and microbiota-specific antigens. Consisting of 15-mer peptides with 11-amino-acid overlaps, PepTivator Peptide Pools cover the complete sequence of the respective antigen. Available in research-, premium- and MACS GMP-grade. The most popular PepTivator Peptide Pools are also available in a 96-well cell culture plate format for high-throughput cell activation. Finally, the CD3 and CD28 pure – functional grade antibodies, human are suitable for in vitro T cell activation and expansion. The CD3 (OKT3) and CD28 (15E8) antibodies recognize the respective human receptors. Upon receptor binding, a stimulatory signal is transferred that, in combination with additional cytokines (e.g., IL-2 or IL-7/IL-15), leads to the activation and expansion of T cells. 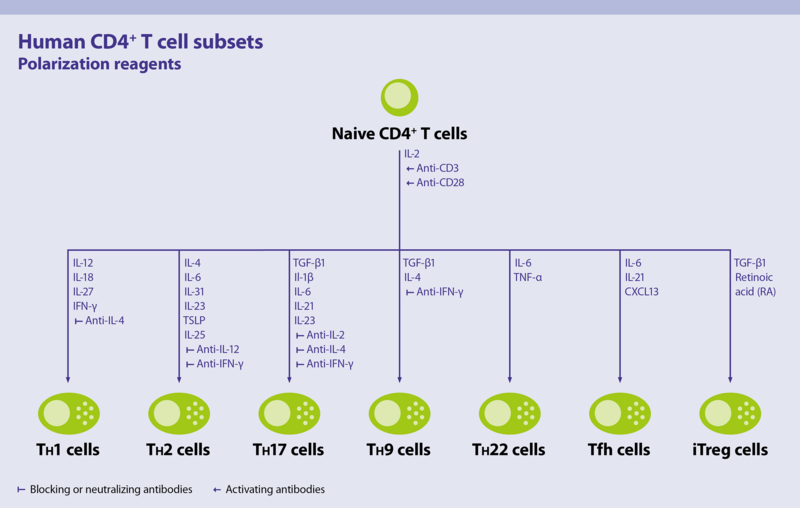 By combining polarizing cytokines and blocking or activating antibodies (‘functional-grade’), naive CD4+ cells can be differentiated into a variety of different TH cell subtypes. With the optimized TexMACS Medium, premium-grade cytokines, and a vast array of functional-grade antibodies, Miltenyi Biotec offers multiple tools for the efficient polarization of naive CD4+ T cells. Human TH cell polarization using MACS Cytokines and functional-grade antibodies. 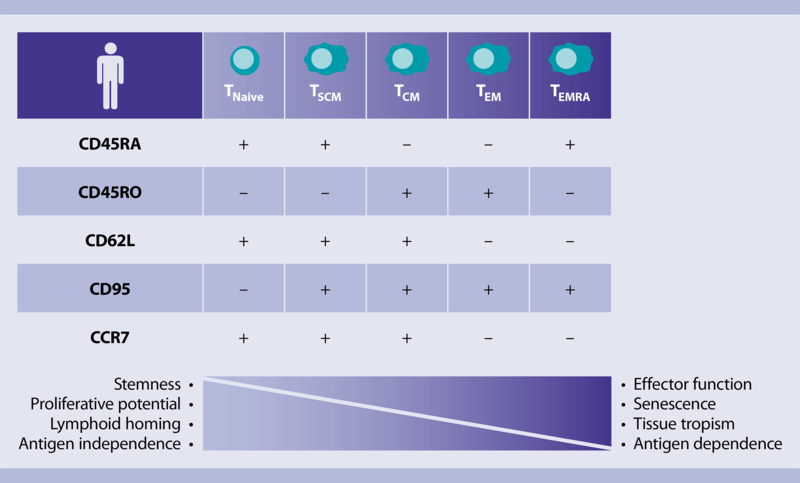 Tissues must be dissociated into a single-cell suspension for many downstream applications, including isolation of cell subpopulations, cell culture, or flow cytometry analysis. Combining mechanical dissociation and enzymatic treatment by using the gentleMACS™ Dissociator with Heaters and specific Tissue Dissociation Kits enables reproducible T cell isolation. T cells can be obtained with excellent yield, high viability rate, and preserved cell epitopes even from hard-to-process tissues, including tumor, skin, and brain tissue, among others.